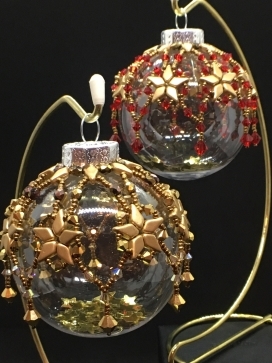 Christmas ornament covers are adorned with Stars of Gold or Silver with touches of sparkles in Swarovski crystal pearls and beads. 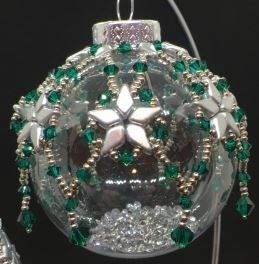 A beautiful ornament to enhance your Christmas decorations or a lovely gift for family. Note: Kits contain 2 shatter proof ornaments and all beads for each. Stands not included, but details supplied. REQUIREMENTS LIST: A complete requirements list/kit contents and tutor details will be supplied in the PDF document (as a link) contained within the confirmation email upon registration and payment.